How useful is it for learning? How accessible is the tool? I strongly recommend you install the “LiveBinder It”. The ability to add websites to any binder as you come upon it without having to visit your binder directly is quite nice. You can observe tutorial videos via the website or subscribe to the YouTube channel for anytime/anywhere self-paced training.The second concern expressed focused on how useful LiveBinders would be to education. 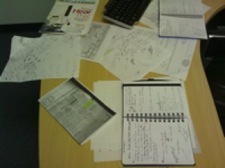 To address this concern lets start by looking at the features currently available within this Web 2.o tool. First of all, all free binders are eligible to store up to 100Mb worth of uploads. Those uploads can be arranged in a collection of tabs and sub-tabs. Website URLs can be added with there being a 10 second period for the site to be grabbed. The “grab” function permits the site to become interactive within the tab/subtab selected. But the features don’t stop there. 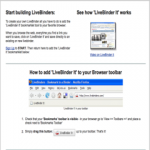 LiveBinders permits users to import bookmarks from their Delicious accounts, add images via Flickr import or uploading from a computer in .jpg or gif formats. Uploads are not just limited to images. Audio files (ie mp3), video files (.mov) or search YouTube via tags or by username, documents files (.txt/.docs/.ppt) and PDF files all can be uploaded and interactive. PDF files will open up within the tab or subtab as a webpage fine on a PC. 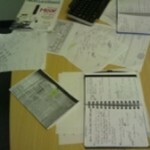 On a Mac Safari displays the PDF correct but Firefox needs to have the plug-in via PluginDoc. Another convenient feature provided within LiveBinders, is the ability to use text layout templates. These templates are very similar to those you see in Powerpoint to help organize how text, images, or audio are presented. The final point I want to make about the usefulness of LiveBinders is how it can be used to compile numerous items within a single topic. 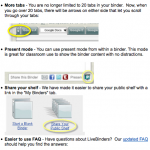 If you visit the “Featured Binders” tab on the main website you will see how educators are using this Web 2.0 tool to share and organize their educational resources. 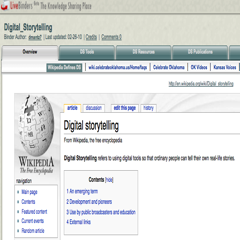 Here is an example of a single virtual binder I have created for Digital Storytelling resources. Digital_StorytellingRecently LiveBinders has been updated with some great enhancements. 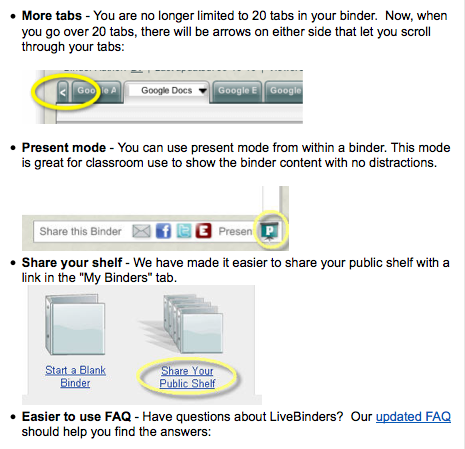 This image points out how the limit of 20 tabs per binders has been removed, a “Present” mode has been implemented to provide users the same functionality as “Play” mode in Powerpoint, and the last two added features are being able to embed your bookshelf of binders (Here is my bookshelf) and easy access to LiveBinder’s FAQ section.The final concern expressed by educators dealt with accessibility of the tool. Keeping in mind how easy it is to create a binder or add to one already created via the “LiveBinder It” that accessibility is addressed. The next issue of accessibility always worrying educators, is if the site itself is blocked. As an educator and one of the two folks responsible for maintaining our school district filter, LiveBinders will probably be detected and listed within the “File Sharing” category. Well, here are three items and one future enhancement that should address the concerns of those responsible for the filter that may help you get it open for all possible users or at least for educators if your Internet access is tiered. Binders can be kept “Private” ( as mentioned before) use a “Key” (password) to access it. All public binders are reviewed to make sure material is educational appropriate. Public folders can be set to “Not Copyable”. Thus, keeping it viewable to everyone but not reproducible. (Future enhancement) 3rd Party service to help identify users below the age of 13.
ders for educational resources along with the ability to embed a binder or shelf within one’s own site should, ultimately, address those questions regarding the design for educators with educator input. Future enhancements will include the ability to have multiple people login simultaneously and contribute resources as well as working with a third party organization to assure those under the age of 13 are capable of creating their own LiveBinder yet meeting federal COPA/CIPA regulations. If this review does interest you but there remains a few questions, please consider watching this YouTube video created by the Barbara Tallent of LiveBinders.